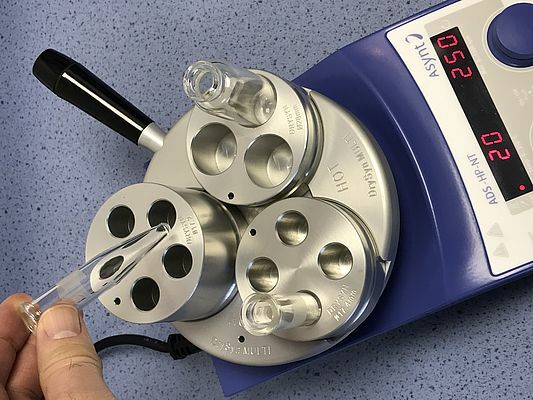 Asynt has announced new inserts for its DrySyn heating blocks enabling scientists to now conduct precise temperature controlled, stirred experiments in 0.5-2ml tapered, 2-5ml and 10-20ml microwave vials. Available as an option for the DrySyn Parallel Synthesis Kit the new microwave vial inserts allow you to heat and stir up to 27 small scale reactions in parallel using any standard hotplate. The DrySyn Parallel Synthesis kit enables clean, safe synthesis without the hazards or problems associated with silicon oil baths or heating mantles. With no messy oil, heat resistant handles, and a wide selection of simple-to-configure reaction inserts - DrySyn is the heating block system of choice for thousands of labs around the world.